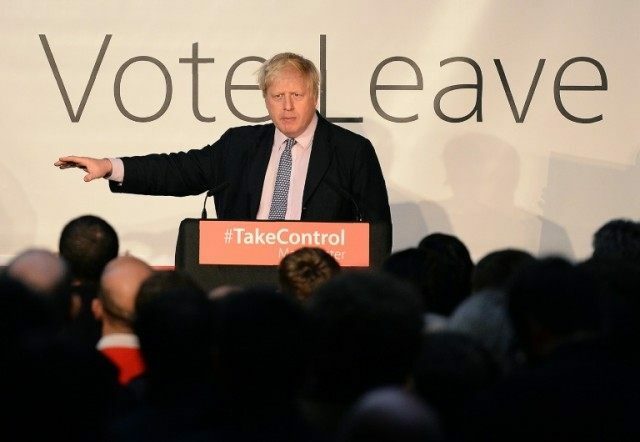 London (AFP) – London Mayor Boris Johnson on Friday launched a scathing attack on Brussels, urging Britons to vote for a “glorious alternative” free from “the whims of unelected bureaucrats”, as official campaigning began ahead of a referendum on Britain’s EU membership. With G20 leading economies warning of the threat to global growth if Britain voted to leave, Johnson told a rally in Manchester, northwest England, Britain could thrive outside the bloc. Activists from both camps hit the streets Friday, firing the starting gun on a tense battle over the nation’s future, the British people’s first direct say on Europe in 41 years. “It’s time for us in this country to speak up for millions of people around Europe, tens of millions, who think like we do, who share our anxieties, who are fed up with the remoteness of Brussels,” Johnson told the crowd. “If we hold our nerve and we’re not cowed and we vote for freedom and we vote for democracy on June 23 then I believe this country will prosper and thrive as never before,” he said. Opinion polls suggest the British public is evenly split 10 weeks ahead of the vote, which could bring down Prime Minister David Cameron and plunge one of the world’s leading economies into uncertainty. G20 finance ministers meeting in Washington listed Brexit among other factors that “complicate the global economic environment”, a day after IMF chief Christine Lagarde urged Britain and the EU to save their “long marriage” through dialogue. In the “Remain” corner is Cameron, who says Britain has a “special status” within the EU thanks to a renegotiation he sealed in February, and that the country will be richer and stronger if it stays in. In Covent Garden in the heart of rain-soaked London, anti-Brexit volunteers were handing out leaflets to workers during their lunch breaks Friday. “Financially, it would be a disaster if we left the EU,” said Gael Simmonds, wearing an “I’M IN” t-shirt. However, John Curtice of Strathclyde University, Britain’s leading poll expert, said the evidence available so far consistently points to “Leave” voters “being keener to make it to the polls”. “We absolutely think we’re going to win it,” Peter Reeve, a spokesman for the UK Independence Party (UKIP), told AFP as he campaigned in Peterborough — a market town in eastern England where an influx of East European workers has angered many locals. Overall, the “Remain” and “Leave” camps are neck-and-neck on 50 percent support, according to a poll of polls run by academics at the What UK Thinks project, with around one fifth of voters undecided. Cameron has said he is confident of winning the poll, despite the opposition of ministers in his own government and around of a third of his Conservative Party MPs. “Remain” supporters can also count on the backing of US President Barack Obama, who will head to London next week to join an international chorus of leaders imploring Britain not to leave the EU. But Johnson called Obama’s stance “hypocritical” saying the United States “would not dream” of accepting restrictions on its sovereignty like the ones Britain has because of its EU membership. Cameron’s campaign has the support of the main political parties and some of the country’s biggest employers.